Acoustic microscopy is a technique that exemplifies the advancements and accomplishments of science and technology. It allows for the expansion of research, creates opportunities for discovery, permits deeper exploration of a specimen and enables scientists to better analyze and observe micro-environments. By enhancing their ability to study a sample, scientists can obtain more accurate data, prove or disprove a theory, gain an understanding of the unseen world around us and pursue new cures, treatments or products to make every day life safer and healthier. Laboratory scientists are always looking for ways to improve studying techniques, observation tools for viewing specimens and analytical methods so that they can obtain accurate data throughout the course of their tests and experiments. This demand led to the creation of acoustic microscopy, as scientists needed a way to view the internal structures of specimens at a micro level. Originating in 1949, the technology for this device, which consists of obtaining an image using ultrasound waves so that one can view spatial properties of a sample, was ahead of its time. The first actual acoustic microscope would not exist for another 24 years and even then, the mechanisms were, at best, mediocre. Technology continued to improve and with it, came the birth of the modern model of the acoustic microscope known as SAM. 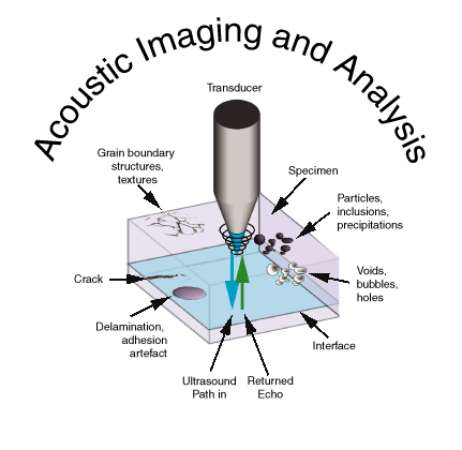 Scanning acoustic microscopy, or SAM, is the most current type of acoustic microscopy available to today's scientists. They can use it to view a sample internally without staining it or causing it any damage thanks to point focusing technology, which relies on a beam to scan and penetrate the specimen while it is in water. Scanning each point individually with a wavelength of less than one, SAM eliminates opportunities for interference and then creates the overall image by bringing together those obtained from each point. Since SAM can view internal structures, it has the ability to pick up on sub-micron features, such as popcorn cracking and die attach voiding, both of which a typical x-ray would not be able to detect. Additional benefits of this technique include its ability to measure the depth of internal layers, check ceramic direct bond for delamination and maintain sample quality of hermetically sealed items, while also evaluating the purity of flip chip underfill. Aside from those already mentioned, scanning acoustic microscopy has additional benefits over other microscopes scientists may have at their disposal. A traditional microscope allows you to see the surface, maybe even the subsurface, of a specimen but the acoustic microscope focuses in on a specific point and obtains images from deeper layers. In addition to allowing for a better view of a sample, SAM also takes accurate measurements, which other microscopes may not be able to obtain, at least not at the same micro-level as an acoustic microscope. The acoustic microscope has another interesting characteristic, as it has the power to distinguish carbon-fiber from other materials that a manufacturer might use to reinforce a product. Lastly, the use of ultrasound waves enables the specification of a focal point by limiting diffraction, thus permitting more accurate results and increased data, all while preserving the sample's integrity. As cool as acoustic microscopy is, it does have its downfalls, mainly because of the naturally occurring structure of sound waves. Technology has yet to find a way to manipulate sound waves so that problems such as slow processing time, too high a sensitivity to delaminations, cost and failure to adapt quickly to economic changes, may become a thing of the past. The limitations of acoustic microscopy are preventing it from becoming a widespread field when it comes to scientific study and analysis, but that does not mean it is without purpose. In fact, acoustic microscopy is important not only in the medical field but also in the microelectronics industry. Manufacturers use the technology to determine if a product is good enough to sell to a consumer or if it is defective and needs to go into a discard pile. Some companies use SAM in analytical labs to determine the quality of flip-chips, a new technology that is starting to change the design of electronics components. Failure analysis is probably one of the most important and widest spread uses of SAM, as it prevents companies from shipping bad products and saves them thousands of dollars, if not more. SAM helps to establish if electrical components have bad leads, which could cause the product to not perform correctly or at all. Companies also prefer SAM for this type of analysis because it is quicker, safer and cheaper than other methods currently available. As for scientific applications, many researchers have yet to explore SAM and its potential, despite the doors it could open in areas like pathology, neuroscience and histology. Still, those that do use scanning acoustic microscopy are finding it helpful in studying heart disease, arterial problems, lymph nodes and live cell cultures. Furthermore, this type of microscope also offers benefits studying a specimen that is temperature sensitive, once again making it a scientific tool with yet another means by which it preserves a sample. One way the acoustic microscope could be extremely beneficial, though it is not currently used in this manner, is when drilling for oil. If the microscope's design could change to one similar of a fiber optic camera or a periscope, oil companies could use it to check the sub-surface area of the drilling site and possibly prevent leaks, spills and other means of contamination. SAM is a huge machine so to bring it to this size would be an extraordinary challenge but if achieved, this could eliminate damage to the environment. Acoustic microscopy has yet to gain the recognition it deserves and it will probably continue to be an underused tool until it improves or someone makes a significant scientific breakthrough utilizing this technology. However, if you are up for the challenge or just like to explore the unknown, then consider conducting some of your own experiments with the acoustic microscope, as you may discover a missing link, a cure or a way to improve an electronic device.